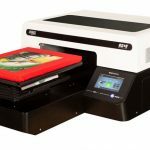 DTG Digital, maker of the DTG line of direct to garment printers announces a new DTG ink set. On the heels of its release of the DTG G4 Direct to Garment Printer, the company announces a brand-new ink set custom made for the printer. “We are even more impressed with the results of this new G4 DTG ink set than we thought we’d be” said Roderick Verweij, European operations manager. “Our engineers and chemists have worked hand in hand to produce inks and pretreats carefully formulated for the G4’s ink delivery system, and the research has paid off in amazing looking prints that last”. The CMYK and white, delivered via cartridge for consistency are tuned specifically to work with the G4 printer. Coupled with new pre-treats that offer softer hand feel, greater wash-ability and easier application, the DTG G4 chemistry set simply outperforms. The ink itself has a higher viscosity with less surface tension than previous DTG branded inks. The inks produce high quality prints with an industry first in colour gamut, while it takes advantage of the hardware configuration to reduce maintenance. Jerry Erich, Product manager for DTG Digital said this about the development: “There’s no air in the ink delivery to the print head nozzle plates, enabling more reliable and predictable printing results without the maintenance levels currently seen in the market. And, we adapted the WIMS system for white ink management for the G4 DTG printer which greatly contributes to preventing settling. It’s just great engineering and a great ink set to match”. According to the company, the main features of the new DTG ink set are: less white ink settling, higher viscosity for continued ink delivery to the nozzle plate, no dye migration in heat setting, lower cure times, less machine maintenance needed, better consistent colours batch to batch, latex derivative formulation, superior wash-fastness, superior dry and wet rub and an unbelievable soft hand feel.